This is what we had, so this is what we used. Stacked high with cloth diapers, Elmo hangs out when I need an emergency distraction. (He sings to her, bless that Elmo.) The reusable wipies (made from cut up tee-shirts) I stack neatly next to the reusable wipie tub full of soapy water. Compostable diapers for outings or wonderful-angel-sleep-through-the-night times fit nicely underneath along with biodegradable wipes and those made from bamboo we’re trying out for the big, messy poops. Inside the drawer, I stuff diaper covers, plastic pants, toilet paper, extra cloth diapers for coffee spills, and diaper rash cream—which I really need to look into a recipe to make myself. I actually change the little thing on the ottoman or the couch. It’s right beside this table, in front of the window where the sun shines through. I have a bag of distraction toys to keep her occupied from the annoying habit of flipping over. The only thing that might suffer a bit is my back, but if I’d learn to sit up straight like Betty Rose and stop doing the slouch, I’d be much better for it. It forces me to practice. Honey, I’d rather struggle a little bit any day in order to consume fewer resources and waste less for my child’s future. Isn’t that what it’s truly all about? Being a parent? Thinking of someone else instead of yourself? Sacrificing for their betterment? And really, I’m not that put out by it. I mean, how long will I be changing diapers in the long run of an 80 to 100 year life span? I’m not buying something new (or even used for that matter) if I already have something else I can use. It’s all about using that imagination. If you have any stories of how you did without or how you used your creative noggin, please share them here so that others may also feel less alone, too. This entry was posted in Baby, Reusing and tagged baby changing station, baby needs, baby products you don't really need, cloth diapers, Consumer, making do with what you have, military spouse, miltary zero waste, needs vs wants, reducing carbon footprint, reusable wipes, Shopping, using less, using what you have, wasting less, zero waste. Bookmark the permalink. Used plasic yoggie pots make good building toys, and nothing is as exciting as a train made from cardboard boxes, or a house if the box is big enough. And after a while I realized that I could simply use a toilet paper sprinkled with a little water. I was amazed of how stupid I got about those wipes. How easy we get comfortable with the store bought stuff and don’t think how to make it ourselves anymore. I was actually pretty ashamed of that whole situation. These days I use toilet paper for wiping the little one anyway because she gets rashes very easily and the store bought wipes make it even worse! btw, I had never used changing table, although one of our crib came with it. I don’t see the need for that, really! 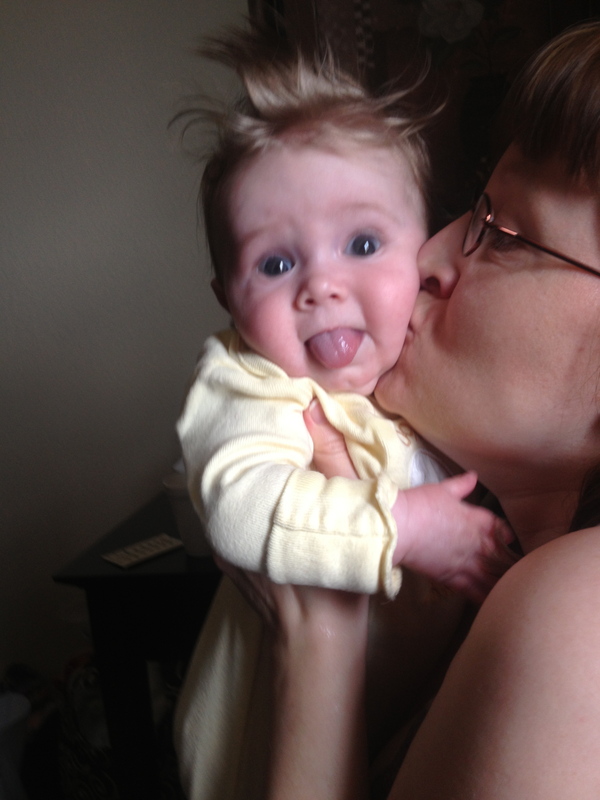 Those things that make your life easier when they are babies are really only useful for such a short time. My baby changing station was the laundry room. Actually, our laundry room was also the nursery, because we didnt have a second bedroom in our first place. The babies got bathed in the plastic landry sink, then changed and dried on some folded towels set out right bedside the sink on the washer and dryer. It worked great for me. 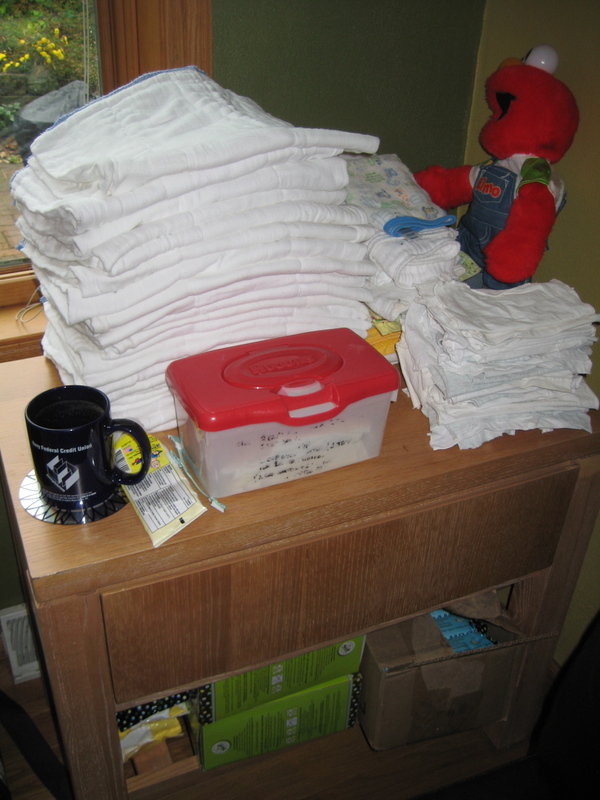 I had a little change table that my step dad and father in law built for me, which I also used, but mostly as a spot to hold diapers, receiving blankets and clothes. 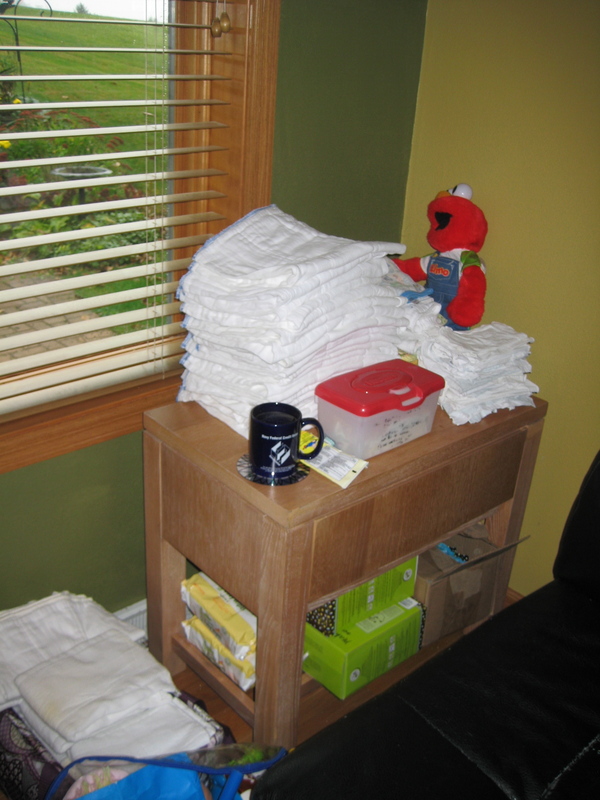 And since the change table was right next to the laundry sink, I could use little cloths to wipe bums for diaper changes instead of diaper wipes – the warm water was always right on hand. Oh, Heidi! Too funny about the laundry room. Our “nursery” was our bedroom’s closet, which is only slightly smaller than a small bedroom, complete with window and air vent. It worked, especially when night-nursing. Finding useful purpose in all things is what being a mother is all about, isn’t it? Love that picture at the end! You are so doing it right. Don’t change a thing! PS — as soon as my kids could stand on their own two feet, I would change them while standing. This is a very useful skill to have.